XTERRA World Champion Ruben Ruzafa wins his third straight XTERRA major while Coralie Redelsperger won her first-ever at the inaugural XTERRA Portugal in Golega on Sunday. 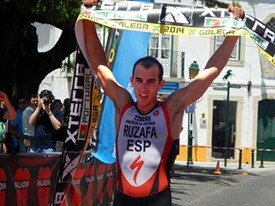 June 1, 2014 (Golega, Portugal) – XTERRA World Champion Ruben Ruzafa wins his third straight XTERRA major while Coralie Redelsperger won her first-ever at the inaugural XTERRA Portugal in Golega on Sunday. XTERRA managing director Dave Nicholas was on-site to take in all the action and brings us this report. A great end to a grand weekend. Two fabulous days of competition in Golega, Portugal with perfect sunshine and weather, friendly people, tight competition and some first-time endings. We need to talk about the total immersion of the city into XTERRA. Organizer Jaime Rosa had “3 right arms” as he called them, who took ownership of the bike course, the run course and the volunteers. Dozens of workers in their bright yellow CREW shirts were everywhere. Local police had every intersection handled and the race went off without a hitch. Brit Asa Shaw led the swim with a surprising Francois Carloni on his heels and Ruben Ruzafa and Belgium Yeray Luxem close behind. The bike starts through the twisty, cobble streets of Golega for the first 3K and by the time the men hit the fields and double/single track Shaw had dropped back. “I don’t know what happened, I just couldn’t keep up with them” he said. Ruzafa led, but Carloni and Luxem were no more than a few feet behind him. For the women Jacqui Slack led out of the water and had a solid lead; for a while. Surprising teenager Ana Alcacarenho was second (she is a swimmer and lives in Golega) with new pro Sandra Koblmueller from Austria riding a bit tentatively in 3rd and French pro Coralie Redelsperger in 4th. At 15K Carloni (always a fast biker) and Ruben were still feet apart but Luxem was back about 30-seconds with a tire that was going flat, Asa hanging in 4th. Coralie had passed all the women to take the lead with Jacqui second and Sandra hanging in for 3rd. But as Yogi said “It ain’t over till it’s over”. Yeray’s tire did flat and he fell off the pace by about 3-minutes; Francois and Ruben came into T2 absolutely together but the Frenchman was penalized 15 seconds for not putting his wetsuit in his transition box. That sealed the deal for Ruben. He ran a controlled pace and was never threatened. Carloni, who had suffered foot problems over the winter, had them crop up again but soldiered on to finish just over 3-minutes behind the World Champ. Yeray pulled back some time on Carloni but it was not enough. Another surprise was Frenchman Nicolas Durin who had pedaled and run himself into 4th overall. Will Kelsay was a solid 4th but got himself off track twice on the run and Asa passed him for 4th pro with Will 5th. Coralie was out front, something she had never done before. Jacqui was hanging on and slowly reeling Coralie in but what neither knew was the Austrian Koblmueller was flying after them. Jacqui got within a minute and a half of Coralie but Sandra passed Jacqui in the last few K and almost caught the French girl and finished just 40 seconds behind. Coralie improved throughout 2013 and has truly improved her bike.”I am really getting fast on the downhills” she smiled.Sandra admitted her technical skills are not the best, but she has plenty of power on the climbs and as she says “running is my preference”. The race finished in the center of town with lots of local folks hanging about in the shade having lunch or some “tinto” wine and watching the finish. This is a great city and a great race. Fast, but tough, some technical pieces, some power places and lots of surprises like a run and dive off a military pontoon in the lake and a quick rope rappel on the run. The first two races of the European season are over. Next weekend we head to Brazil then back to the States for XTERRA Richmond which will also serve as the USA Tri Off-Road National Championship on June 15, then back across the pond for XTERRA Greece, France and Sweden. XTERRA Portugal was the 15th of 36 events where the fastest amateur athletes from around the globe could qualify to race at the 19th annual XTERRA World Championship at Kapalua, Maui on October 26, 2014. Up next, the XTERRA Brazil Championship in Ilhabela. About TEAM Unlimited/XTERRA TEAM Unlimited is a Hawaii-based television events and marketing company, founded in 1988. It owns and produces XTERRA and in 2014 will offer more than 300 XTERRA off-road triathlon and trail running races in 25+ countries worldwide. In addition, TEAM TV has produced more than 300 adventure television shows resulting in three Emmy’s and 42 Telly Awards for production excellence since 1990. View samples at www.xterra.tv, and learn more at xterraplanet.com and xterratrailrun.com.